Concerns that changes to AS-levels will harm university admissions are unfounded, the schools minister David Laws has argued in a letter to Labour. Government analysis has shown that GCSEs are slightly better predictors than AS-levels of whether a student will get a good degree, writes Mr Laws. Labour says it will reverse many of the coalition's planned A-level changes in England if it wins the next election. From 2015 the government says AS-levels will not count towards full A-levels. Under the changes new A-level courses to be taught from September that year will depend on linear exams taken after two years in the sixth form. 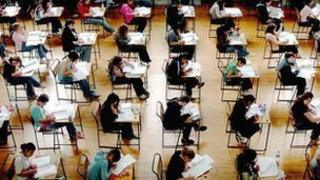 AS-levels will still exist, but as stand-alone exams. Many universities base their offers of places to students on the results of AS-levels which are taken in the first year of sixth form study. Students also use the results to decide which subjects to take as full A-levels. Decoupling the two sets of exams would reduce the importance of AS-levels and the plans have drawn criticism from many teachers and universities, including Cambridge, which argues that they will "jeopardise over a decade's progress towards fairer access". Earlier this month, Labour's Shadow Schools Minister Kevin Brennan pledged that Labour would not support a "policy that undermines both rigour and equity". The government has argued that A-levels and AS-levels in their current form do not help students develop a deeper understanding of their subjects. Now government statisticians have cross referenced GCSE and AS-level results with degree results, looking specifically if top school exam results are accurate predictors of a degree at 2:1 or above. "The analysis showed that knowing GCSE results alone allows a university to correctly predict whether a student will receive a 2:1 in 69.5% of cases," writes Mr Laws in a letter to Mr Brennan. He added that AS-levels alone correctly predicted the outcome slightly less frequently in 68.4% of cases. "Knowing AS-levels as well as GCSEs does not add significantly to an admission officer's ability to predict outcomes. Knowing both increases the prediction accuracy only slightly from 69.5% to 70.1%", concludes Mr Laws. He argues that GCSE and AS grades both "record essentially the same information about the student: their general academic intelligence and willingness to work hard." "Once you know a student's exam results in one set of these exams, you learn little by knowing the results in the other set of exams," he argues. He says that this is why he government has decided to prioritise additional teaching and learning over additional time devoted to exam preparation. He argues that the government's plans will "help move us away from the current state of affairs in which English students are subjected to constant streams of exams". A spokesman for the University of Cambridge said the government analysis did not reflect its own research where AS scores were found to be a better predictor of success than GCSEs. "But this is about more than just the admissions process, loss of AS- impacts on student choice, flexibility and deprives them of the chance to apply to university with confidence. The spokesman added that some 10% of Cambridge entrants do very well at AS-level despite poor GCSE performance. "If offers were to be based on GCSE results these students would not present a true picture of their ability, nor of their positive progress in sixth form. Around 75% of this group come from state schools and colleges." Mr Brennan said: "The minister's response to my letter falls short of the mark. "His plans will undermine widening access to university. They will narrow choices for young people. A linear exam at the end of a two year course is not always the best way to assess learning. "In pursing these socially regressive plans, he is damaging the learning opportunities for young people."